Is Scandinavia on your travel wish list and you don’t know where to start? I thought I would share our 11 day Scandinavia itinerary taking in three countries, four cities, and the fjords of western Norway to help with your trip planning. Over a week and a half you visit Norway, Sweden and Denmark. You explore four fascinating cities and experience some of the world’s most incredible natural wonders. You discover pretty harbours, modern architecture, unique Nordic culture and the waterfalls and soaring peaks of the fjord country. Travelling mainly by train and boat, you are surprised at how relaxing it is to travel without a car, with the added benefit of choosing an environmentally friendly mode of travel. Along the way you enjoy the delicious seafood and baked goods for which Scandinavia is famous. 5 So, when are you booking your trip to Scandinavia? The Scandinavian countries itinerary is suitable for all types of independent travellers; from families and couples to solo travellers and was straightforward to organise. Example – All of the booking sites have versions in English so it is hard to get into a muddle. We are trying to be a lot more thoughtful about how we travel so the program was built with responsible travel choices in mind. The itinerary uses trains and ferries to get around. This mode of travelling is not only much more eco friendly but also incredibly scenic with a few added bonuses such as wifi and a children’s play area thrown in for good measure. In Scandinavia, the countries and many of the hotel chains are committed to sustainable travel choices. When researching our Swedish stop in Gothenburg I was thrilled to learn that 86% of the hotel rooms in Gothenburg are environmentally certified. So this part of our planning was made very easy for us. Norwegian Air flies into Bergen and Copenhagen direct from New York, London and several major cities in Europe. We have flown with Norwegian many times now and like the efficient Nordic service, leather seats and flight schedules. It was difficult for us to find flights at the times we wanted with premium airlines. Norwegian is a low cost carrier competing with EasyJet and WizzAir so do not expect luxury. Apart from the efficient service, the difference to those airlines is Norwegian fly out of higher quality airports and terminals so the experience is more pleasant. We are not budget travellers, but on this trip were careful keep an eye on our spending as Scandinavia is notoriously expensive. I have added some tips on doing the same towards the end of this post. Bergen is known as the gateway to the fjords but you must spend a few days exploring this seaside city and uncover its many treasures. Time to take to the water and join the half day Mostraumen fjord cruise along the beautiful Osterfjord. The cruise takes you past tiny hamlets and through narrow waterways where mountains rise majestically overhead. The cruise leaves from the pier outside the fish market at 10:00am, 14:00pm each day with a 18:00pm sailing during summer. You can buy tickets from the Bergen Tourist Information Office nearby. Use the other half day to explore one of Bergen’s museums and galleries. My pick – the newly opened Norwegian Fisheries Museum. The Søgnefjord is known as the King of the Fjords because it is the longest and deepest. From May 1st to September 30th you can take the 5½ hour journey to Flåm along the Søgnefjord from Bergen to Flåm on the ferry express boat. Take this slightly slower option if you like to relax and watch the scenery go by in comfort. Departing at 08:00am from Bryggen in Bergen, the ferry stops at several towns along the route and slows down for those all important photo opportunities on deck. We lost count of the waterfalls we saw along the way and I would rate the journey as one of the highlights of our trip. Many passengers spent the entire journey on deck breathing in the pure fjord air. The alternative route is to take the train from Bergen to Voss and then continue by bus to either Gudvangen or Myrdal to transfer to Flåm by boat or the Flåm railway. The ferry arrives into Flåm at just after 13:00pm. This gives you plenty of time to check in to your hotel and wander around tiny Flåm for an hour or so. If you are feeling energetic there are several walks in the area for all levels of fitness. Pick up this information at the Flåm Tourist Information Office or your hotel. Or you could take a Fjord Safari. 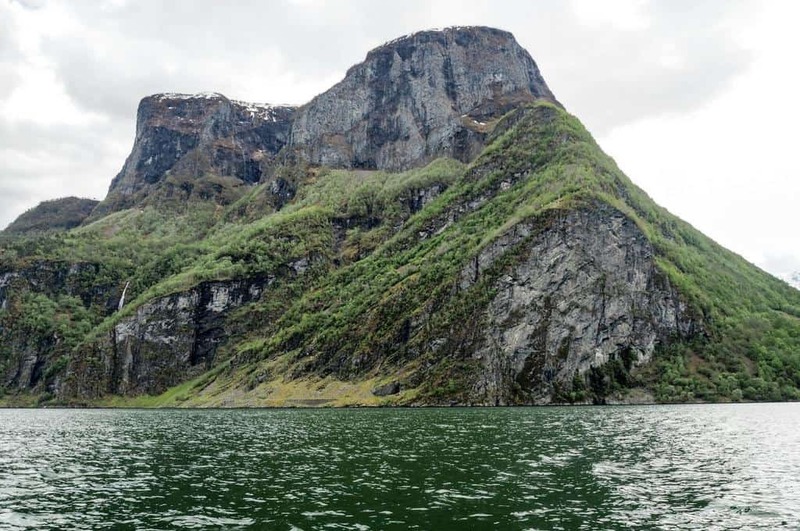 We took this option and loved flying along the Aurlandsfjord and the Nærøyfjord in a little speed boat, listening to our guide’s tales of the area and looking out for local wildlife. This unforgettable experience puts you right on the water with the mountain peaks soaring overhead. You can also choose, as we did, to combine the fjord safari with a stop at Undredal to taste the local award winning cheese. Good to know – Safety and comfort are priorities on the tour. You are kitted out in warm waterproof suits, hats, gloves and life jackets. in Spring and Summer the fjord safari is suitable for families with small children. Our three year old twins had a great time looking out for ice monsters and seals. Today you take to the rails and begin the journey east to Oslo. If you’re organised you could also add in a trip to the Stegastein Viewpoint prior to your train departure from Flåm. The panoramic views from the lookout give another perspective of this incredible landscape. Take the bus to Stegastein at 10:00am which gets you back to Flåm in plenty of time for the 12.20pm departure to Myrdal on the Flåm railway. At Myrdal Station transfer to the train to Oslo for the 5 hour cross country journey across Norway. The scenery changes dramatically as you descend from the mountains and icy lakes, still covered in snow in Spring, to the meadows of central Norway. Though not as dramatic as the Flåm railway, the landscape is mesmerising and the time passes quickly. Good to know – there is a soft play area on board the train for families – this is pure genius! We did not see our kids for hours and they had fun making friends with little Norwegians. The food service on the train is limited so take some snacks. The bakery at Flåm is a good place to grab a sandwich. Time to take in some Norwegian culture and explore Oslo. Head to the Bygdøy Peninsula, where most of the city’s museums are found, on the number 30 bus from outside the train station or museum ferry from Pier 3 outside City Hall. 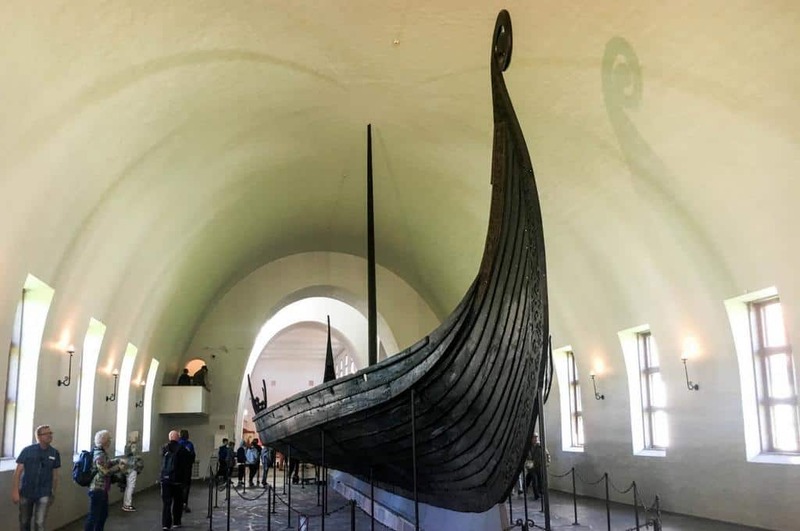 You could take a full day to explore the museums on Bygdøy but you must not miss the Viking Ship Museum and Norwegian Folk Museum. Spend the late afternoon relaxing by the fjord at Oslo’s beautiful Opera House. It might surprise you that Oslo is great city for exploring the outdoors. Today visit Vigeland Sculpture park in Frogner Park. Just a short ride from the city centre or Aker Brygge wharf, you can spend a couple of hours wandering the park and admiring over 200 sculptures by artist Gustav Vigeland. The ferry drops you back at Akers Brygge, Oslo’s harbourside where you can enjoy the cafes and shops before you go to the train station for your onward journey to Gothenburg. Next stop, Sweden! Take the train to Gothenburg from Oslo S (Oslo Central Station). The journey takes 3½ hours and before you know it you are in another country. Don’t forget your passport! Book your onward journey to Gothenburg with NSB – check timetables and book tickets online. Gothenburg is a compact city, easy to explore on foot, bike or using the efficient tram system. But I suggest you get your bearings by taking a paddan boat tour through the city’s canal system and out into the working harbour. On a sunny day you must take a trip out to the archipelago and visit some of the islands by ferry. Many of the islands are car free and perfect for exploring on foot. More about tripping the archipelago in my Gothenburg guide. Have you visited a Scandinavian amusement park? You should. Liseberg in Gothenburg is Scandinavia’s biggest amusement park with over 40 rides and attractions. We were impressed by the retro and modern rides, short lines and reasonable ticket prices. Stroll around Gothenburg’s Haga district and enjoy the ambiance of the cobbled streets and cute as a button boutiques and cafes. If cinnamon buns are your thing you must stop at Cafe Husaren to check out the biggest buns (though perhaps not the tastiest) you have ever seen. Cross the canal and head on over to the indoor fish market Feskekòrka and enjoy checking out the catch of the day. Continue along the canal until you reach the Botanic Gardens where you can relax on the grass or wander through the themed gardens. Onward to Denmark! Leaving from Centralstation the journey to Copenhagen takes just over 3 hours. The highlight of the journey is feeling like you are flying over water on the 8 kilometre long Øresund cable stayed bridge. Book your rail tickets online at SJ – Swedish Rail. Wonderful Copenhagen is a relaxed and friendly city that is easy to explore on foot. But you really should hire a bike and do a tour of the city on Denmark’s favourite mode of transport. We did it and you can cover all the major sites easily in a day, stopping to take in the views and atmosphere of the beautiful Danish capital. But if biking is not your thing, start at the Little Mermaid and stroll along the waterfront to Amalienborg Palace to see the changing of the guard. Next, visit Copenhagen’s pretty harbour Nyhavn and catch a boat tour around the city’s canals before crossing the pedestrian bridge to Papirøen and the Copenhagen Street Food market. After lunch take a walk through bohemian Christiania, a unique Copenhagen neighbourhood surrounding a pretty lake. On your second day in Copenhagen take a visit to Rosenborg Castle, one of the prettiest castles in the world in my humble opinion. Set in the glorious Kongens Have or King’s Gardens the castle was the summer house of the Danish Royal Family and is home to the Danish Crown Jewels. In the afternoon visit one of Copenhagen’s interesting neighbourhoods Nørrebro. Wander through Assistens Cemetery, the final resting place of Hans Christian Andersen until you reach Jægersborggade. This funky street is home to cafés and boutiques and is a great way to soak up the city’s laid back vibe. No visit to Copenhagen would be complete without a visit to Tivoli Gardens. So much more than an amusement park, Tivoli has been entertaining the people of Copenhagen since 1843 and has a charming retro feel. Here you can enjoy fairground rides, walking through the gardens bursting with floral displays or enjoying the scheduled entertainment. The highlight of the daily program at Tivoli is the spectacular Illuminations, a sound and light show on the Tivoli Lake. Tivoli has something for everyone but we especially loved the sweet Flying Trunk ride that takes you on a magical journey through 32 fairytale scenes. End your Scandinavian trip on a high with a stroll down Strøtget, Copenhagen’s famous pedestrian shopping street. Throughout your trip you have no doubt admired the sophisticated yet cosy Scandinavian style. You will definitely find an appropriate souvenir to bring home with you. As promised here are our tips for ensuring you don’t go over budget on your trip to Scandinavia. Scandinavia is no different to any major tourist destination in that visiting during the shoulder season during late Spring and early autumn gives you the best chance of good weather and reasonable prices. Norway in particular sees particularly high rates over the peak summer months in the fjord regions. The highest accommodation costs we had was in Flåm where there are only two hotels. For this reason I would avoid staying in Flåm if you are on a strict budget. We were impressed with the way Scandinavian hotels have responded to the cost issue. Some offer a buffet breakfast and dinner service included in the room rate or as a small additional charge. Shopping at the local markets and street food outlets (of which there are many) means you avoid restaurant service charges and uplifts. The standard of food is excellent across Scandinavia so you will eat well regardless. Alcohol is very expensive in comparison with southern European countries so you can save some pennies here by going on a mini detox. The city cards we used during our trip were great value – especially in Oslo. They include public transport and free or discounted entry into the main attractions of the cities we visited. You can buy city cards for 24, 48, or 72 hours. If you plan your time effectively you can save significantly this way. Prebook trains well in advance and you will get the best deals. In Norway there are a limited number of heavily reduced minipris fares, that are non-changeable and non-refundable available to book online. Cost is probably one of your major inhibitors of a family trip to Scandinavia. Am I right? Well we were surprised to learn that most travel and attractions are free for children under 4 years old with significant discounts for children 16 years and under. Even the fjord safari was free for our 3 year old twins so I didn’t really mind when one fell asleep in the middle of it. If you can overcome the cost issue then Scandinavia is wonderful for travelling with children. Public transport is a breeze with easy to enter vehicles and often special designated areas for prams and buggies. The inter city trains in Norway have specially dedicated family carriages which have a children’s soft play area and tv that runs cartoons. They are understandably very popular so it pays to book early and secure your seats. The only problem with the train system across Scandinavia was a poor food service. On one leg we resorted to emptying our change into a vending machine and our choice of salted licorice was not a good one! We were pleasantly surprised with the accommodation options we found across Scandinavia. Some hotels have drop down bunk beds and play areas for small children. The buffet dining options at dinner are a great option for families looking for convenience after a long day sightseeing or travelling. Scandinavian cuisine features lots of fish. Our children love fish but some don’t. In this case, you can always turn to kid friendly favourites like hot dogs, pasta and burgers which you can find everywhere. We always head to the markets on our travels as they are great places to pick up delicious and interesting local food. I have mentioned these throughout the above itinerary. Hotel breakfast and dinner buffets are great places to stock up on healthier options like fruit, yoghurt and vegetables. We were very surprised at the quality and variety of dishes on offer. There was always plenty of salad to offset the quite remarkable dessert sections. Lastly, you should definitely make time for a stop at the famous amusement parks Liseberg in Gothenburg and Tivoli Gardens in Copenhagen. With rides and activities for children of all ages at reasonable prices, these parks help mix up the activities on your trip. And who can resist a rollercoaster? So, when are you booking your trip to Scandinavia? ▪️ How much does it really cost to visit Iceland? Disclaimer: This article contains affiliate links. If you make a booking after clicking on one of these links, we may receive a small commission at no extra cost to you. All opinions are our own. thank you Jenny – hope you can find a way to travel to Scandinavia soon. Ha! They loved them too. They were very warm and snuggly – one even fell asleep! Great itinerary! Wish I could go on that trip ASAP! All those cities/towns are on my bucket list! I did see cheap flights to Copenhagen, I need to jump on it! Thanks Keri – it felt like my third thesis 🙂 Probably nearly as long! Oh you really must go to Norway. The landscapes are incredible! Wow everything is covered! I loved Denmark, Sweden and Norway still to be visited tho! Loved the Tivoli. Thanks Elizabeth. I’m keen to explore Norway more too – particularly up in the north and also around Stavanger. There’s a new Viking experience they are opening near Gudvangen either this year or next that promises to be spectacular too. What an incredible post full of so much advice and information. This is definitely one to save for a trip to Scandinavia. Thanks so much for sharing. 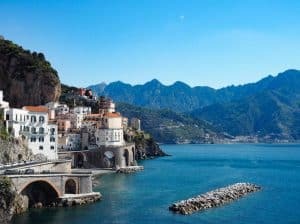 Amazing post – a great itinerary and so much good info! Will definitely come back here if I make my way to Scandinavia! This is such an incredible itinerary Katy! I have friends who are planning a big trip in Scandinavia and I am sending this to them asap! Thanks Juliette – walking tours are great too. Actually my friend Caroline is a guide for the “free” tours in Copenhagen. We did a lot of walking the first time I was there so I wanted to get on a bike and cruise around like a local. Thanks for downloading – any feedback welcomed! I have done exactly the same trip last year, except that I went from Gothenburg to Stockholm last year. It was a wonderful trip, but I have yet to visit Copenhagen. Hopefully sometime this year, I will discover the capital of Scandinavia as well. What a fantastic itinerary you provided. This is awesome! I love the idea of traveling without using a car. What tips do you have for lugging around your luggage etc so as to not be burdened with all your stuff? Hi Emily, the trick is to take the essentials only. Having said that, I am still learning the fine art of the light pack! Ideally you could go carry on only but if not, I would get a medium sized suitcase with 4 roller wheels as checked luggage and a crossbody bag or backpack for the plane and day outings. I love crossbody bags as they keep your hands free for your camera/phone too. On this trip we had to take our big winter coats as the weather can change quickly and get very cold. We were lucky though and didn’t need them – though I was annoyed to carry them around with us.